Our commercial concrete picnic tables are designed with durability and longevity in mind. Heavy duty commercial quality concrete picnic tables are a favorite of institutions such as schools, office buildings and restaurants where public exposure is at its highest. Including different frame styles like rectangular, square, round, and ADA friendly to perfectly accommodate your furnishing needs. Browse our concrete trash receptacles to match your concrete picnic tables. These industrial grade picnic tables are low maintenance and can have a weight over 1000 lbs. greatly reducing the risk of theft. 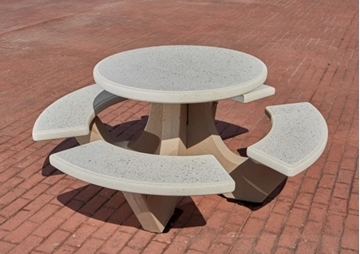 Picnic Furniture's concrete tables are proudly built in the USA with a 1-year warranty provided. See our Blog post about Concrete Care and Maintenance for commercial concrete picnic tables. Concrete Picnic Tables are Eco-Friendly! Something you probably didn't know about concrete picnic tables is that they are environmentally friendly. Concrete is made from organic materials and our suppliers reuse materials when it is practical. In addition to the obvious "green" aspects of our concrete picnic tables, it is notable that they do not require replacement as often as other types of picnic tables. With all the great benefits of concrete picnic tables; Picnic Furniture provides the lowest shipping cost on these heavy concrete picnic tables and includes a lift gate service. Our company has gained national recognition as the best store to purchase concrete picnic tables.